Amerks Home Tonight and Looking for the 40th Win · Let's Go Amerks! We’re down to the last 12 regular season games of the season and tonight is the first of only five home games remaining before the playoffs. Where the Rochester Americans are going to finish in the standings is still a toss up. After leading the North Division for the majority of the season they now sit in second place by five points behind the Syracuse Crunch. You can either look at that as the pint is half full or half empty. Rochester has a game in hand on Syracuse and the two teams still play each other three more times. The Amerks host the Cleveland Monsters tonight and then the Amerks travel to Toronto for back to back road games. These games have as much meaning for the Monsters and Marlies as they do the Amerks. Cleveland is struggling to gain points and get into fourth place while Toronto is only three points back of Rochester. There’s a scenario where the Amerks get back into first place. There’s also a scenario where the Amerks drop to third place. There’s one thing we do know – this Amerks team is going to the playoffs. From the start of the season the goal was to be an elite American League team and they’ve been there for most of the season, the last thing they want to do is stumble in the final month. As they say, they want to feel good about themselves. Last season the team entered the playoffs after a rocky second half of the season, the last thing they want to do is have a repeat of sort. “The guys are pretty disappointed from last weekend but hey, we have 12 games left here and it’s up to us to make the playoffs here,” Chris Taylor said after practice this week. Last weekend the Amerks lost back to back road games in Charlotte. They were outscored 7-2 which sounds like a blow out but there was opportunity to win both games. Over the last 10 games the Amerks only have seven power play goals on 49 chances. In just the last game versus Charlotte the team went 0/9 on the power play. The power play had been getting better as the season went on but has hit a major speed bump. Overall the power play is 7th overall in the league and the penalty kill is 11th overall. At this point in the season doing ok isn’t good enough when the goal is to be an elite team in the league. The team is also chasing the 40th win of the season as they head into the 65th game. Taylor will be the first Amerks head coach to lead his team to 40 or more wins in a season (once they get there) since Benoit Groulx (44) during the 2009-10 season. Early this season, Taylor reached the 30-win mark for the second straight year, becoming the first Amerks head coach to lead his team to 30 or more wins in each of his first two seasons behind the bench since Hall of Famer Randy Cunneyworth, the all-time winningest coach in franchise history. The team did reach 43 wins during the 2012/2013 season but Ron Rolston had been named Sabres coach before the team reached the 40th win. 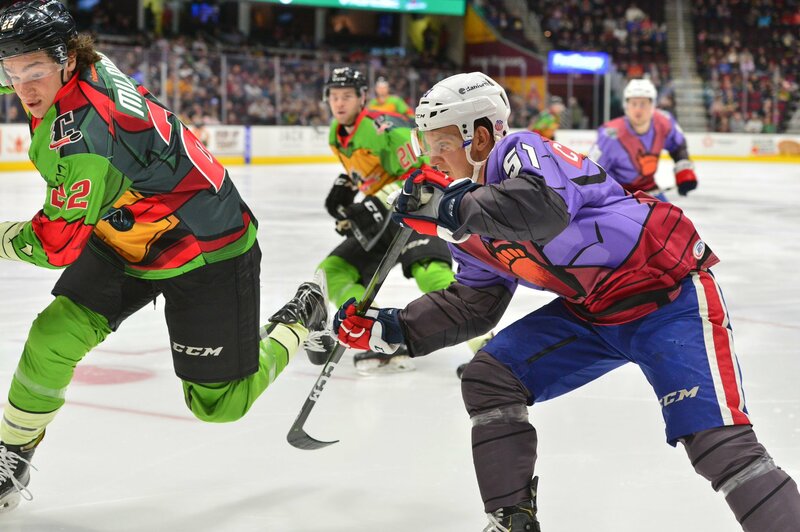 Just a reminder that tonight is turtles vs foot clan night with the ugly jerseys pictured above. The Monsters are the turtles, Amerks are the foot clan. The two teams wore the same jerseys earlier this season in Cleveland and have a rematch of them tonight. They’ll be available for auction in the concourse. Sean Malone will be back into the lineup after missing the last four games again with a lower body injury. He had played seven games where he scored one short handed goal. Zach Redmond is out of the lineup with a lower body injury and is considered day to day. He played both games in Charlotte last weekend, didn’t practice at all this week with the team. Expect Adam Wilcox to get the start tonight and Scott Wedgewood to play back to back in Toronto. Like many of us that work a 40 hour work week we look forward to our days off. The team had a planned two days off after the games in Charlotte. Some players enjoyed some beach time, others went to New York City, others enjoyed time with family and friends. The game will be streamed for free on Facebook tonight. Click the link below and choose get reminder.